The North American Christian church of the early twenty-first century finds itself in a period of decline. A growing percentage of young adults are not entering the front doors of churches while at the same time older and previously dedicated Christians are leaving. Reasons for the rise of the Nones and the Dones have been well-documented: they have found the institutional church to be increasingly irrelevant to their lives; they want to be part of an engaged and interactive community rather than members of a passive audience; they are sick of judgmentalism and exclusion; they question the efficacy of churches spending 85 percent of their budgets on buildings and pastoral salaries; they are not in accord with political/ideological stances of their churches or denominations; they are disinterested in serving organizational structures; or they simply no longer believe the doctrines taught by the churches in which they grew up. Coinciding with the deflation of the Western church and the dramatic increase in Nones and Dones is the explosion in popular culture of the mindfulness movement, which emphasizes meditation practices derived from Buddhism. These concurrent phenomena—the decline of Christendom in North America and the rise of a Westernized form of Buddhism and various secularized applications of Buddhist meditative practice—form an interesting juxtaposition that warrants exploration. In Presence and Process, Daniel Coleman has created a unique and useful synthesis—showing how a convergence of perennialism, process theology, and mysticism (Christian, Buddhist, and Quaker) could have a profound role in fostering spiritual formation in this postmodern, post-Christendom age. This is a pioneering work of practical theology. After three decades in Quaker ministry, I’ve noticed how religious traditions I once believed to be separate pursuits now merge as one. Truth, as it turns out, is happy to share the road with others. 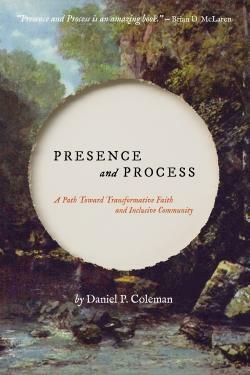 Daniel Coleman’s helpful book, Presence and Process, marries Christianity and Buddhism for contemporary seekers. Both traditions are honored, both enriched, and both made better by Coleman’s thoughtful union. In our time when people are leaving church but are as spiritual as ever, inclusive and incisive resources such as Presence and Process are deeply needed. As interest grows in mystical traditions, bridges of recognition are built in surprising places. This wise, well-researched book creatively weaves Buddhism, mystical Christianity, Quakerism, and process theology. It is just this type of sensitive boundary-crossing that will help lay groundwork for the meaning-seekers of the future. Presence and Process is an amazing book. It provides the best, most compact introduction I’ve come across to key concepts like mysticism, contemplation, and process theology. It explores the productive ferment that is taking place at the intersection of Christianity and Buddhism. And it invites practitioners to imagine a new kind of church for the journey before us. I highly recommend Presence and Process. Daniel Coleman’s book points the way to a global spirituality, joining East and West, and theology and philosophy. Intellectually solid and spiritually insightful, Coleman’s text captures the heart of the Buddhist and Christian mystical traditions in ways that respond to the needs of spiritual seekers of our time. Presence and Process is an excellent invitation to the growing global mysticism of our time in which spiritual pilgrims creatively integrate practices from diverse religious traditions and in so doing not only experience spiritual insight but transform these traditions themselves. In a time when religious institutions are struggling to survive, Coleman provides a pathway to institutional and spiritual transformation through lively global and earth-affirming spirituality. While some long for fruitful dialogue between Christianity and Buddhism, Daniel is bringing in the first fruits of the harvest! In Presence and Process, you get a clear and insightful invitation to a place where the boundaries we have inherited between the East and West, contemplation and justice, and theory and practice are dissolved. I loved so much of this book, but can’t wait for church leaders to take the ecclesiological vision to heart. Coleman works from a fertile field of thinkers in order to unpack—as much as such a thing is possible—the experiential core of Christian and Buddhist practices. His account of contemplation is a much-needed corrective to the empty moralism afflicting many religious communities. The resulting synthesis of Vipassana and apophasis has as much to offer the lay practitioner as the professional theologian. If Karl Rahner predicted that the survival of Christianity will depend on Christians becoming mystics, Daniel Coleman shows why that is the case and how Rahner’s hopes might be realized. His review and comparison of Christian and Buddhist contemplative practices will speak to both those who are struggling with, as well as those who are looking beyond, organized religion. The book’s brevity belies its engaging richness.